Alyce Santoro, Tall Radio Towers #132, #140, #172, #184, ink on sound paper, X , 2006. 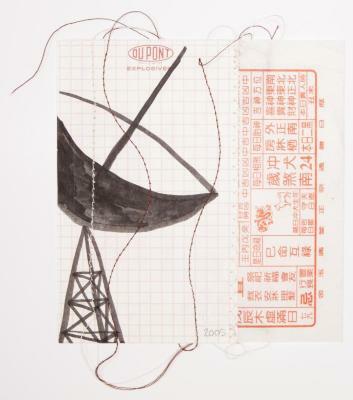 Alyce Santoro, Small Still-Life Dish with Chinese Calendar, Collage with thread, X , 2006. Alyce Santoro, Dupont Explosion, Collage with thread, 3 in X 5 in, 2006. Alyce Santoro, Fucus with Threads, Ink, pencil, thread, white-out, 6 in X 9 in, 2006. Alyce Santoro, Fucus with Orange, Drawing, X , 2006.